There are adventure games. And then there are detective adventure games. If we followed the historical logic of the name “adventure games”, we might as well call them “deadline games”. Sure, there were adventure games with detectives and crimes even before Deadline (we’ve even seen one of them in the past). 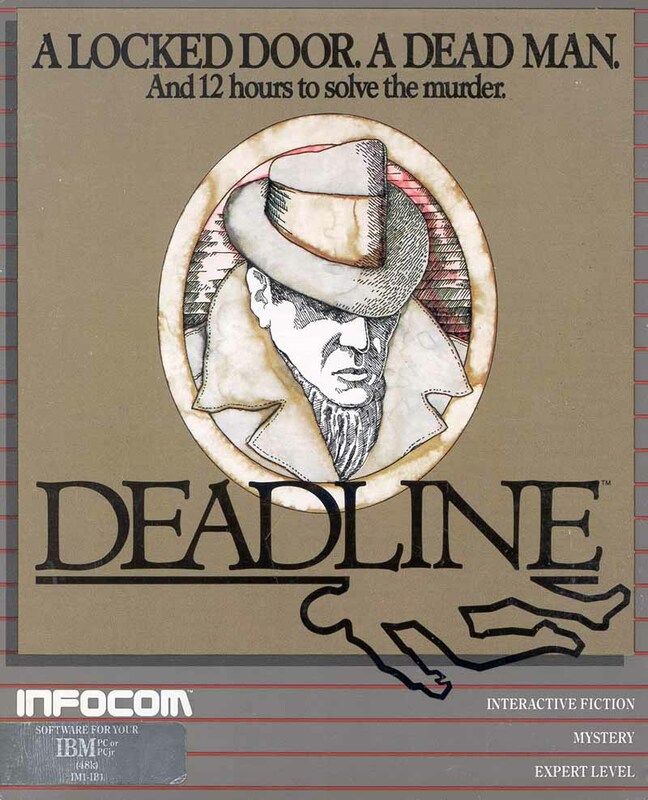 But Deadline was most likely first adventure game with the serious intent on solving, not puzzles, but crimes and mysteries (and yes, I definitely wait for the first commenter, who mentions some crucial early mystery game, which I have missed and which did all that I said Deadline does). In fact, Deadline is a game of many firsts. It was the first ever non-Zorkian game by Infocom, that fabled source of quality text adventures. It also appears to have been first Infocom game with only one designer, Marc Blank, perhaps better known as one of the co-authors of original Zorks. Deadline was also the first Infocom game to include feelies. Indeed, the feelies were essential to the game, since they primarily introduced the story behind the game. And these were no cheap trinkets. 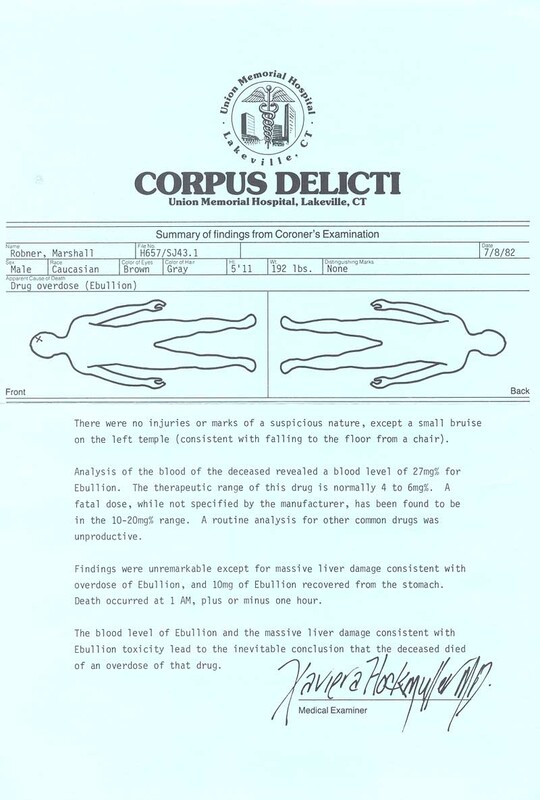 The whole game was packaged in an evidence folder, which together with the disks and the manual contained lab reports, fingerprints, coroner’s report, a photo from the crime scene - even a sample of pills supposedly found near the dead body. Sadly, we who know the game only from later collections will have to be satisfied with photocopies and scans of the originals. 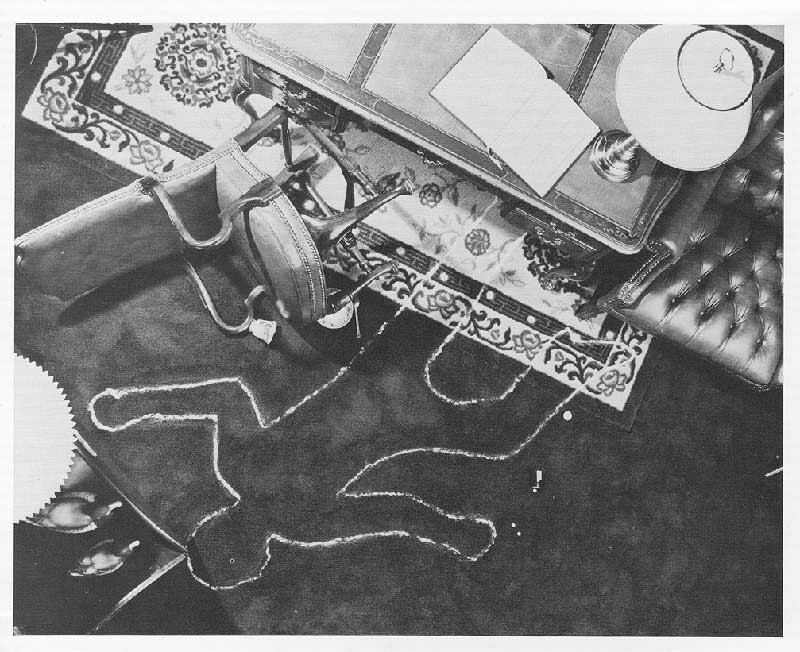 It shows a real dedication to reconstruct a fictional crime scene, just for the sake of a photo. Before getting further with the actual plot of the game, I would like to describe, what in my opinion are the central features that make up a Deadline-style game. If you open up a detective novel, chances are, lot of it is spent in detective questioning everyone involved. Looking for inconsistencies, searching for motives, breaking up those pesky alibis - it’s all done mostly by talking. Sure, you might want to gather some physical evidence, but that only takes you so far. A detective finds a footprint, or a parked automobile, or a monogrammed handkerchief, and then dashes off on a wild chase without ever learning that crimes can't be solved by deductions based merely on material clues and circumst'ntial evidence. (10 CAPs for the first to recognise the detective I am quoting, 20 CAPs for the first to know what it all has to do with a duck wearing gardener’s boots). It’s then no wonder that a proper dialogue starts with a game like Deadline. You can ask anyone about anything related to the crime, you can show them stuff you gather and ask their opinion on other people - the possibilities are endless. Like the name Deadline tells you, time is of the essence. There had been timed sequences in adventure games before this, but here the time is of so great importance that it takes the role of space in a usual adventure game. This is something I need to explain in more detail. CRPG Addict once said that while in CRPGs you could plausibly assume that the first set of adventurers you pick up will also survive, more or less, until the end of the game, in an adventure game you are more like sending heroes to test where the inevitable death traps lie and only at the final moment sending the real hero, who now can use all the information gathered by the previous heroes and their deaths. Addict’s description works well in a more or less static adventure game, where plot moves forward, only when you’ve managed to make some crucial move. Not so in a Deadline-style game. The game plot moves forward, no matter what you do, people having their own schedules, moving about and doing whatever the script commands them to do, and when the deadline comes, the play is wrapped up and the game is finished. You can then begin the game anew, but it is not like a different hero going into the same dungeon, but more like same person experiencing the almost same set of moves, like in a game version of Groundhog Day. A successful playthrough of a Deadline-style game requires then not just mapping the spatial environment, but also the temporal sequences in the game - where was Colonel Mustard at the moment, when the singing telegram came in? If this means that you’ll spend one round of game just following the good Colonel and seeing where he spends whole day, so be it - during next cycle you’ll be doing same with Mrs. White. We’ve already seen games with a similar approach to mystery plots. Mortville Manor is an obvious example, and so is Kenny’s beloved Scoop. Colonel’s Bequest almost does it, but is still more of a hybrid with elements more in line with a regular adventure plot style (e.g. clock doesn’t move until you’ve witnessed some key event). "Just one more question”, you think, and the next thing you know, you’ve got a broken nose, because people don’t like Columbo-style tactics used on them. When you are interacting with other characters in a Deadline-style game, they often do not remain their neutral selves, but might react to what you say or show them. Sometimes it’s all for good and the criminal spills her beans accidentally, but often the characters just get miffed up and stop talking to you for a while - or they might even throw you out of the house. With the original Deadline, there’s not that much dynamic interaction going on, but you definitely can upset some people with your questions or by ACCUSING them. In addition to these three features, common to many detective games, Deadline has its very own peculiarities. The nameless detective is not an amateur, like Dupin or Holmes, but a member of police force and can thus use the facilities of the crime lab. First and foremost, he can ask his assistant, Sergeant Duffy to analyse evidence, get fingerprints, search for suspicious substances etc. Another peculiarity is the ARREST-command. Yes, the game demands that you really go to the culprits to arrest them - something not so usual even in detective games. Of course, it is not as easy as going through all the suspects and arresting them one by one, since the game tracks how much evidence you have managed to gather and arresting someone prematurely ends only with a failed case. The setting of the case is an apparent suicide. 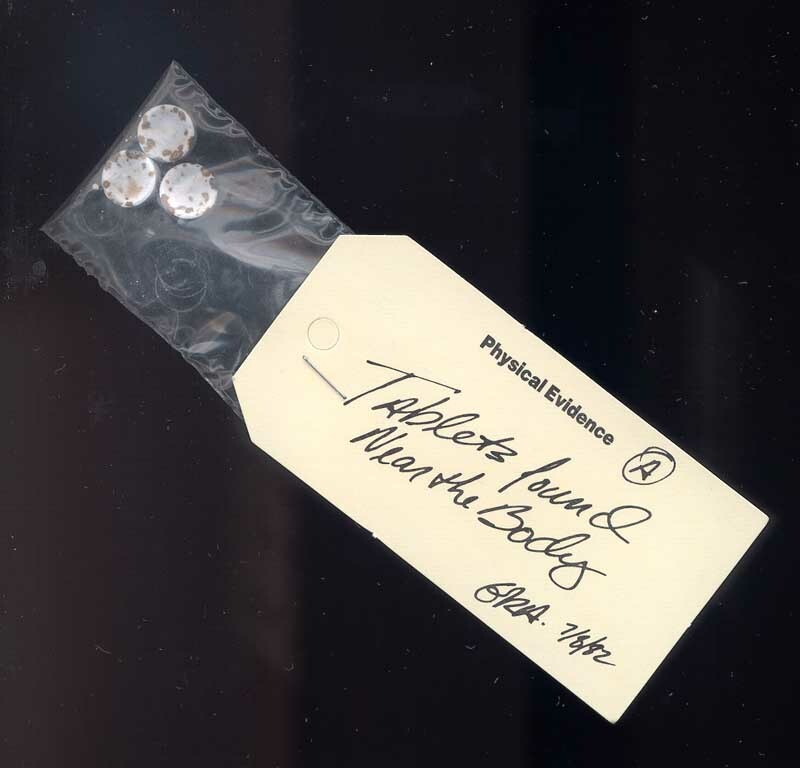 Marshall Robner, an industrialist and philantropist, has seemingly taken an overdose of Ebullion, a prescribed medicine for severe depression, because of financial worries. Robner’s lawyer, Warren Coates, has asked the help of the chief of detectives of Edindale Police Department to at least quash all the suspicions that might relate to death of Mr. Robner. Of course, we already know it couldn’t have been a suicide, because what fun would the game be then? But if it is a murder, it is not really clear who could have done it, since the library where the body was found was bolted from the inside. We are thus facing a classic locked room mystery - and no, none of the suspects owns an orangutang. Starting with the motives, we have a very obvious candidate in Mr. Robner’s only child, George, who is a notorious gambler and whom his father had threatened to disinherit. Indeed, George starts to act very suspicious, if we show him a calendar note, in which his father mentions making a new will. If left to his own devices, George can be seen throwing into a pond some papers, which then become illegible. If instead we follow George, after showing him the calendar, we’ll find out he visits a secret room behind Mr. Robner’s bookshelf. If we time it right, we’ll see a new will in George’s hand - a will, which didn't give George a single penny of Mr. Robner’s fortune. If this were real life, I’d accuse George, but since I’ve read my Poe, I know the obvious young scoundrels are never murderers. Another possible motive is found out, when we eavesdrop some phone discussions. Around 9 o’clock, phone rings, and if you are quick enough, you can hear Mr. Robner’s widow, Leslie, picking it up and saying to the caller that she’ll call him later. Mrs. Robner goes immediately to her bedroom to call to the mysterious person again, and we can listen to bits of this discussion on another extension. A bit later, if we are quick enough to intercept the postman, we can find a letter to Mrs. Robner, from someone called Steven. It appears that the Robner marriage hasn’t been that happy and Leslie has had a paramour. Isn't there a law against reading other people's letters? The final suspect is found out when we check Mr. Robner’s writing pad and do the old “rub it with pencil” -trick. We find that Mr. Robner wanted to speak with his business partner, Mr. Baxter, about something called Focus. If we look in a safe in the secret room, we find out that this was an old business deal, in which Mr. Baxter had embezzled some of the company funds. If we read today’s paper, we learn that Mr. Baxter has immediately after Robner’s death negotiated a merger of Robner Company with Omnidyne - and if we ask George or Mrs. Robner, this is something Mr. Robner wouldn’t have approved. Then again, Mr. Baxter is apparently the most unlikely suspect of the game. Mr. Robner’s housekeeper, Mrs. Rourke has sweared that no one could have went to upstairs, where Mr. Robner stayed, during the night, since Mrs. Rourke would have heard, if someone had used stairs. Thus, it couldn’t have been Mr. Baxter, who doesn’t even live with the Robners. With motives clearly established, let’s talk about means. The first clue is provided by Mr. McNabb, the gardener of Robner estate. While following him in the afternoon, you can witness him cursing about people ruining his precious roses. If you ask more details from Mr. McNabb, he will show you a pair of holes in the rose bushes - holes, which are clearly made by a nearby ladder. Apparently someone used the ladder to climb to a balcony, which is further shown by sign of fallen paint on the balcony railing - and the balcony gives direct access to the library, where Mr. Robner had died. Looks like there’s a reason, why Mrs. Rourke didn’t hear a thing. Now comes a very tricky part in the game. If you count the china in the Robner house and consult Mrs. Rourke, you’ll soon notice that there’s a cup missing. Could someone have switched the cup used for administering some poison to Mr. Robner with an ordinary cup? Would that someone have used the ladder for this? All pure speculation at this point. The hard part is to know that you should dig around the spot where the ladder was used, to uncover a broken fragment of a cup. Analyzing the fragment reveals some toxicant, which is definitely not Ebullion. You can find all sorts of medicines in the Robner household and analyse traces of all of them, but there’s only one positive match: blood pressure lowering drug, LoBlo, which doesn’t mix well with Ebullion. And there’s one person taking LoBlo in the game - Ms. Dunbar, Robner’s secretary, who just fails to have any motive for murdering his employer. Time to play Columbo. If you pester Ms. Dunbar enough and especially show her the incriminating lab results, she will at one point drop a ticket stub to a concert. And it is a concert, which Mr. Baxter had admitted attending to. When you show the stub to both, their stories don’t match - Mr. Baxter says that Ms. Dunbar had to leave early, while Ms. Dunbar claims that Mr. Baxter drove her home. At this point you can get a solid victory by arresting both Mr. Baxter and Ms. Dunbar. The case is pretty clear. Ms. Dunbar and Mr. Baxter were romantically involved and planned to kill Mr. Robner, so that the Omnidyne merger could happen. Ms. Dunbar planted some LoBlo to Mr. Robner’s tea, while Mr. Baxter later retrieved the cup with the drug by using the ladder. Yet, there’s also another possible ending. If you wait too much, after finding the ticket stub, and let Ms. Dunbar get out of your sight, you will eventually hear a shot. Ms. Dunbar has evidently killed herself and left a note explaining that she murdered Mr. Robner all by herself. What about Mr. Baxter then? Well, in a clever twist, you can ask Mr. Baxter for a pen, which just happens to be the pen, with which the supposed suicide note of Ms. Dunbar was written. It is then possible to arrest Mr. Baxter for two murders. There’s an obvious problem in discussing puzzles in Deadline-style games. They might have ordinary recognisable puzzles - how to get in the secret room or where to find the fragment of a cup? Yet, the gameplay is also heavily centered on the one puzzle of putting together all pieces of the plot. Should I take this puzzle into account, as its centrality would require? Or should I rate it with the Story category, since it is not a traditional adventure game puzzle? Looking over what Trickster did with Mortville Manor and Colonel’s Bequest and what Kenny did with The Scoop, I suppose I should punish the game for the rather meager amount of traditional adventure game puzzles - yet, I somehow feel that would just miss the point. There’s one big puzzle in the game - solving the crime - which is quite logical, if you just manage to get all the details right. Then there are smaller puzzles, some contributing to the final solution, others leading you through a wild goose chase. Of these smaller puzzles, there’s one that is particularly unfair - finding the fragment - and since it is central for solving the whole game, the game must lose some points for it. Compared to other text adventure parsers of the time, Infocom’s parser really shines, with the ability to use more than two words in a sentence. The dialogue system is as perfect as it gets in text adventure, the game allowing me to use both ASK GEORGE ABOUT LESLIE and GEORGE, TELL ME ABOUT LESLIE. Furthermore, ACCUSE and ARREST were logical and interesting additions to the usual parser. But the inventory management… This was still a time, when Infocom aimed for realism, which is shown embarrassingly by the player character never having enough hands to hold every important piece of evidence, dropping lab report, when picking up ladder etc. Suffice to say that this leads to some pretty boring sequences, where you have to take the same items again and again, just because there’s no bag of holding that the inspector could use. There’s definitely not enough mystery for a whole book here, but it could make for a riveting short story. All pieces of the plot hang together quite well, and there are enough red herrings to confuse you for a while (yes, that’s a positive in a detective adventure, I’d say). The Digital Antiquarian notes that the setting seems a bit anachronistic - the game is supposedly set in 80s, but everyone acts like in a traditional murder mystery from 1930s - but that’s a minor problem. Despite being a game set in United States, the game has a bit of stiff upper lip -air to it, with everyone sounding very formal and repressed. It’s like someone brought these characters from an Agatha Christie -novel and dropped them in another location, across the Atlantic - the only thing missing is the slightly demented old colonel who used to serve in India. Of course, it’s very much the question whether you are into Golden Age detective novels, and I have to admit that I love every bit of it! If one does want to make some slight criticism, secretary falls a bit to the servant side and thus almost breaks one of the twenty rules for writing detective fiction. Fortunately, Ms. Dunbar isn’t the primary culprit. Text seems quite professional, if a bit unimaginative, and could well have come out of an actual detective story. 4 + 4 + 6 + 0 + 8 + 5 = 27, which divided by 0.6 gives 45. Not bad for a text adventure! It will be interesting to see how well Maupiti Island can hold up against its ancestor. What!? No score graphic? Actually, I think I might even have given a couple of bonus points-- Deadline pretty much opened the door to an entire new genre in text adventures. Prior to this, as far as I am aware, most adventures were of the dungeon-crawl variety. Do you know of any others that were this innovative? Personally, I love this game. The score to this game is comparable to some of the early graphical adventures (King's Quest I, for example) even though we have a zero in graphics. That is impressive! What do you mean there's no score graphic? It's right there at the bottom. Damn. Blogger ate my second comment with a smiley face at the end. Oh well, seeing as I can't edit the reply I'll just have to leave it with you thinking your eyes missed something obvious and are failing you. Thanks TBD for inserting the graphic, which I had forgot to do! Joe: I also thought about giving some bonus points for the game, but then I saw that it managed to get to the top of all pure text adventures even without them. I am pretty sure Deadline wasn't the first game to break out of the Adventure/Zork -mold (The Count of Scott Adams was also a bit different from the regular treasure hunts), but it still was a milestone compared to its predecessors. Like you said, probably no other adventure game of the time had so much new to offer - parser innovations, emphasis on dialogue, believable characters, just to name few things. I feel like you need a different scoring method for a text adventure as they are a very different experience from graphic adventures. Perhaps the adventure community can help you come up with one. Perhaps a category for depth of the text parser for instance? 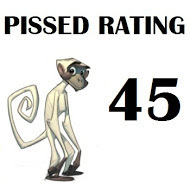 It's obvious that text adventures won't fare well with the PISSED-scores. I am still somewhat skeptical about adding a new score for the parser/text depth, because those issues are already partly covered by Interface -score, partly by Dialogue -score. I've sometimes suggested an alternative SPIED-score, where you just skip the Sound and graphics -category altogether. Deadline would get 54 in that scale, which sounds to me alright. I can remember playing "Deadline" as a 15 year old, at the end of the 80s, together with a friend. We loved it, but could never crack it. And as English was not my mother tongue, it was even harder. But it helped me a lot learning another language quiet rapidly, as did other Infocom and Magnetic Scrolls adventures. Thanks to both of them. I can well see Infocom games used as a part of an English lesson. Compared to some of the text adventures from the same period I've played recently, the time and patience that Infocom put on the language in their games just shines through. The detective you quoted was Philo Vance. Dunno about the duck, though. I don't think I've ever read much of Vance. He sounds kinda like Miss Marple: "Human nature is always interesting..." As in, it's the psychology of the perpetrator that matters far more than material evidence. Yes, it's Philo Vance, most famous from the poem that says he "needs a kick in pance", apparently because he is pretentious snob, who seems know everything about anything. I actually enjoy the books, but I can understand why people would hate the character. As for his use of psychology, Dashiell Hammett said once: "He is a bore when he discusses art and philosophy, but when he switches to criminal psychology he is delightful. There is a theory that any one who talks enough on any subject must, if only by chance, finally say something not altogether incorrect. Vance disproves this theory; he managed always, and usually ridiculously, to be wrong." And yes, the duck. At one book, Vance discusses with a friend about the use of evidence in criminal cases. The friend presents an example: if people say a chicken crossed a field, but the footprints are those of a duck, the animal must have been a duck. Thus, the friend continues, if people say they saw a woman to walk by them, but the footprints are those of a man, the walker must have been a man. Vance objects that humans are more intelligent than ducks and a woman could have been using man's boots. "I am delighted to observe that at least you repudiate the possibility of a duck dressing itself up in the gardener's boots", the friend concludes. Do you happen to recall how long it took you to win? I recently won and clocked it at 9hr 10min. Well, I remembered the details too well for this game, so I purposefully left the whole timing thing out this time. Once you know what to do to get the conviction, Deadline is quite a simple game - it couldn't have taken more than an hour and even that might be an exaggeration. I did spend some time fooling around with the game and getting to some alternative endings, but I guess that wouldn't really count.